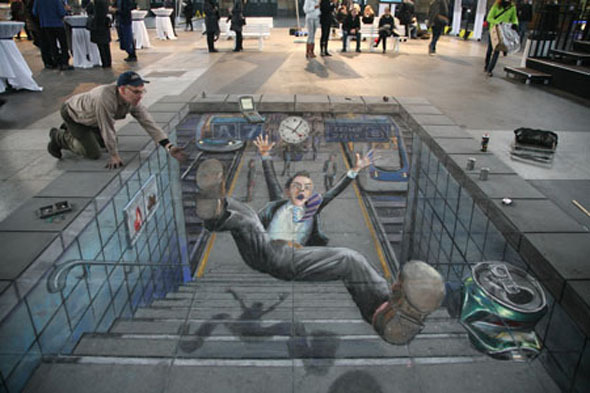 Julian Beever is Back... Again! 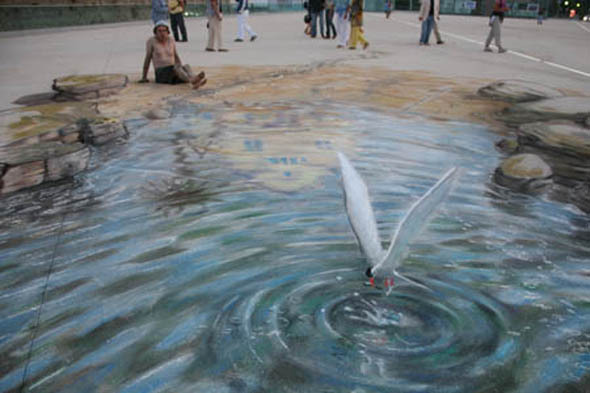 Julian Beever is Back… Again! 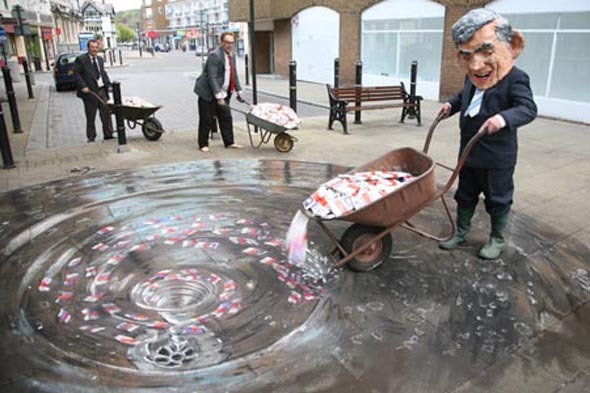 i think the fourth one (gordon brown)isn’t the most realistic, but it’s by far the best. to me, the second one looked the most realistic. D water one with the big-headed freak would have foled me preaty well! I fal really easily 4 dis kind of stuff. The covered image is great. Even knowing the illusions, I thought on first glance it was waiting to be uncovered to expose the image. All are great images. 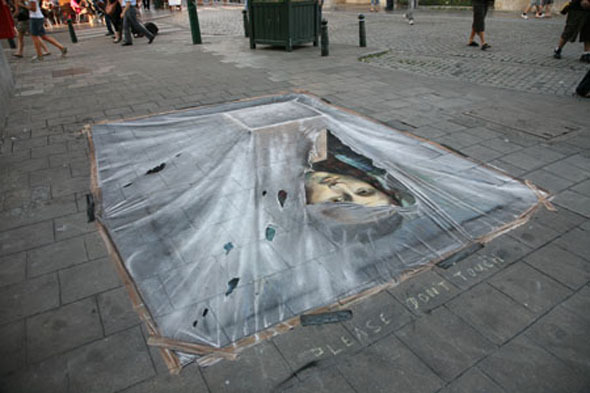 The brilliance of the hidden Mona Lisa one is in how Julian made the sidewalk tiles work in the illusion. The tiles came of ‘natural’, as seen through the transparency of the film / plastic. The one with the bird landing in the water really had me there for a second. I think this type of art is awesome. I’ve seen better, and what the hell is wrong with that second picture? it looks like the wrong perspective to me. These are so good! I really like the last 2. And the mona lisa one looks the most likely to stump me if I ran into it on the street. You never grow tired of looking at these, such awesome detail. i like the one where it looks like they a pooring money into a drain XD, probably because it looks the most believeable. In the first one, the actual edging and tunnel part looked very realistic but the man looked too much like a drawing to be real. I liked them all, ecspecially the last 2! The last one gets my goat with the kid standing on the edge, I can’t hardly believe the others. The plastic covered Mona Lisa is very good, I’d probably look twice. Still, even tho I wasn’t fooled, what an artist! These are really good! We need some for tomorrow! The fly spray? The piles of gold? Redo them!!!!!!!! The nr.4 (election)pic is the best! As always with Beaver – Like it! But it would be nice, if i is possible to see the paintings from other angles! How does it look from the other sides?? Anyone know any links to pictures like that? I like the pond/shore drawing. Notice the reflection of a house and tree that’s not there. I think the Levi’s one is the best! Each one a stroke of genious…..
As usual this guy is fantastic! I love them all but my favourite is the one with the baby peering over the side. Yes I know that it is not real but there is no way that would walk on any of them. Too SCARED! Is that kid about to jump of that building in the fifth one? I’m pretty sure she knows it’s fake because of the angle she’s at. Dang, all those are EXCELLENT. 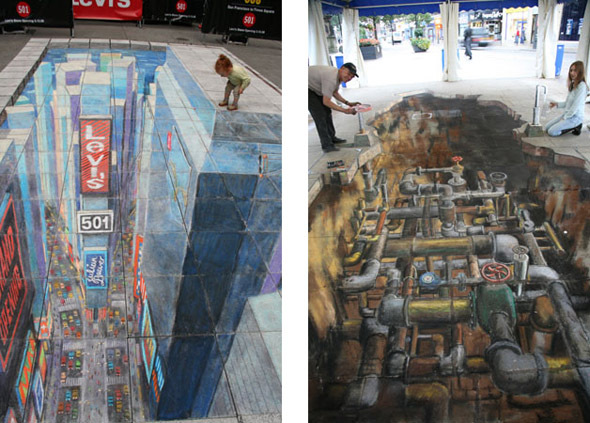 I think the pipe one is the most realistic but they all look real. But I think I like the water one the best. The water looks so real. The second last one was REALLY cool. to iamcheese: i reckon the girl’s looking down, not jumping off bulidings. Thumbs Up if you thought it said “Justin Beever”! Wait, wut? The problem with the second question is the fact that you don’t know which side of the picture you will see first. The trick with these is that you have to come in at a certain side and angle to see the picture. Love ’em all but Mona Lisa is my favorite. Please keep up the good work. I like the one on the bottom left cuz the little child really thinks it is 3D and looks like he/she is looking down which really adds to the 3D-ness of it. Am i the only one who sees “Justin Bieber” when you glance at his name? That’s an optical illusion in itself! Man, I wish I had the talent to create this kind of art ! ! ! This is another ” type ” of my favorite illusions ! ! ! Well done to the artist(s). Excellent work ! !